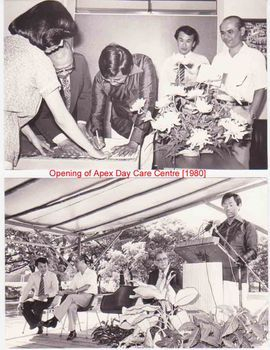 The Apex Day Rehabilitation Centre for Elderly (ADRC) was a pilot project initiated by the National Council for Social Services in 1980. The project was adopted by the Association of Apex Clubs of Singapore who helped raise funds to set-up the Centre. Sisters from the Franciscan Missionaries of Mary are currently assisting in the day-to-day running of the Centre. The Centre provides care and services to the frail and disabled elderly living in the estates around Bukit Merah. It also provides rehabilitation services to elderly patients who face problems with their motor skills. Apex Harmony Lodge (AHL Home for Dementia). Apex Rehabilitation Day Care Centre for Elderly (ADRC).